Centrifugal juicers are extremely popular because they offer two desired qualities, better price and availability. These machines are generally the least expensive and range in price from about $90 to $375 making them a more popular choice. Regardless of price some research is needed before purchasing one, making sure it is the right one for you and your family. Also, these machines can be conveniently purchased at most major department stores giving us (the consumer) a chance to actually see what the product looks like along with listed product information on the box. There are many centrifugal juicers to choose from but one important feature to keep in mind will be motor strength, which does run in the higher dollar range for a descent one. This machine works by finely grating the fruits and vegetables on a blade as you push them through. Then the juice is separated from the pulp by spinning them at a great speed just as your washing machine spins out the access water from your clothes during the spin cycle. The drinkable juice goes through the filtered mesh and comes out of the front of the machine while the pulp gets ejected or stored in a container. How old are those parts in this picture? 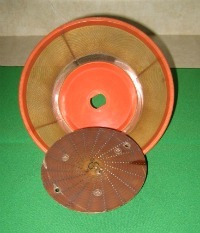 The picture above shows the mesh filter and blade that came from my centrifugal juicer. You can see how worn and discolored these pieces are. We really got full use out of this machine as we have used it daily for over three years. The machine still works but it is starting to struggle some days. The poor thing is just getting old. We decided to invest in a new machine and are now using a twin gear juicer. As its name implies this machine automatically ejects the pulp into a container which is located at the back of the juicer. After you finish juicing you can empty the canister. This style stores the pulp inside of the juicer. You can usually make about 4 cups of juice before having to disassemble the machine to remove the pulp. Both styles of juicers must be cleaned right after juicing. Take my word on this one. If you let the pulp sit and harden in the mesh filter it will become extremely hard and sometimes near impossible to get it clean again. Because of this I don’t really see the benefit of storing the pulp in the machine for this short time and therefore do not see any real advantage of having a non ejection style over an automatic ejection one. If anything an automatic ejection is faster and more convenient in my opinion. Either way it is a good idea to read the manual and take a quick look at some helpful juicing tips before handling your new appliance. 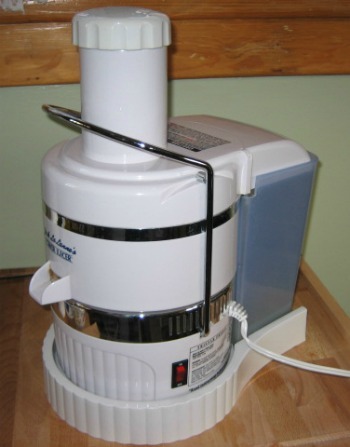 When looking at centrifugal juicers choose a machine with a descent motor. It needs to be strong enough to efficiently grate and separate the juice which helps reduce clogging or overheating of the unit. Some motors can range between 1/4 HP to 1 HP. Choose one that has a wide mouth so you can put in larger chunks of produce in it. This is a nice time saving feature. Is the machine easy to clean? Some brands or models offer parts that are dishwasher safe. If you have a little extra time see if the manufacturer provides some online videos that may give you more information on the juicer you are considering buying. There are also other types of juicers available such as single gear and twin gear including my favorite which is the Green Power Juicer.